I’m currently gearing up for a CHP-3.0.0 release. Version 3 will be (internally) simpler in some places, faster in others, and has a slightly simplified API. The content of the library is mostly there — but I’m not yet ready to release because I want to write more documentation, and more tests. The central event-synchronisation mechanism (which underlies channels, barriers, choice and conjunction). The surrounding communication mechanisms (i.e. the exchange of data) for channels. The monad, poison, and all the associated semantics. Wiring combinators (especially the four-way and eight-way grid wiring). In this post, I’ll talk about the first item: testing the central event-synchronisation mechanism. This is absolutely crucial to the correct functioning of CHP — if there’s a problem in this algorithm, it will affect any code that uses CHP. The algorithm itself is effectively a search algorithm, which looks for events that can take place. The input to the search algorithm is scattered across several Software Transactional Memory (STM) TVars (Transactional Variables) thoughout the system, and the search takes place in a single transaction. The really nice thing about testing an STM-based search algorithm is that we don’t actually have to worry about the concurrent aspects at all. An STM transaction is guaranteed to be free of interference from other transactions. In our test harness, we set up all the TVars to our liking, run the search transaction and look at the results — and this is a perfectly suitable test, even if the real system will have several competing transactions running at different times. Barrier “a” has an enrollment count of 1, barrier “b” has an enrollment count of 3, and the channels are all one-to-one, so they have a fixed enrollment count of 2. We say that p has an offer-set with two offers: one offer contains just “c”, the other offer contains just “d”. Process q has an offer-set with one offer, which contains just “c”. Process “r” has an offer-set with two offers: one contains just “d” and the other contains “a” and “b”. The answers to the search algorithm in this situation is that p and q can communicate together on channel c, or p and r can communicate on channel d.
The first line in the do-block creates our events with associated counts. The next lines make all the offers that we discussed. Note that the distinction between channels and barriers has vanished — that was useful for relating the example to actual CHP code, but underneath this, both channels and barriers use the event mechanism, which is what we’re actually testing here. The final line declares the possible results: either p will choose item 0 in its list of offers (that’s “c”) and q will choose item 0 (also “c”), or p will choose item 1 and r will choose item 0 (both “b”). The nice thing here is that the test is easy to read, and corresponds very closely to what I wanted to express. Writing lots more tests is easy — which encourages me to do so, and thus my function ends up better tested. I’ve written about 25 of these tests, each aiming at testing different cases. 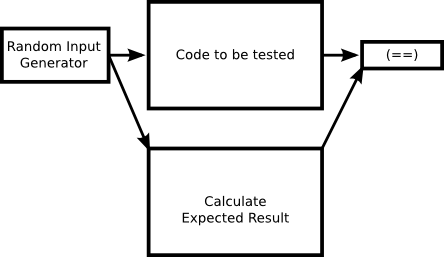 Ultimately our test has type EventDSL Outcome, and we run the inner state monad, we get back: (([EventInfo], [CProcess]), Outcome). This forms the input and expected result for the test, which we feed to our helper functions (which are too long and boring to be worth showing here), which use HUnit for running the tests. The size of the box is meant to indicate effort; the biggest bit of code is what you’re testing, you may need some effort to generate random input data, and then you check that some simple properties hold on the output. Any events that complete must have the same number of processes choosing them as the enroll count. Any events that don’t have enough processes offering definitely can’t complete. Processes can’t select an offer index that’s invalid (e.g. if p has 2 offers, it can’t select offer 3). The search algorithm finds a correct answer when one is available. It feels a lot like double-entry validation; to calculate the expected result, I must code the same algorithm again! In this instance, I wrote a brute-force naive search that is checked against my optimised clever search. I’m not sure if this is still technically property-based testing, but QuickCheck is still handy here for generating the random input. (I guess a search algorithm is a bad choice for using property-based testing?) Regardless: I wrote my brute force search and tested my algorithm. It found no bugs, but now I have two sets of tests supporting me: one set of hand-crafted interesting tests, and a second version of the algorithm used with randomly generated input to pick up the cases I might have missed. This post has been a bit light on technical detail, mainly because testing the algorithm involves a lot of dealing with the internals of my library that would take too long to explain here, and which would not be very interesting. My summary is this: constructing testing EDSLs makes your unit tests clearer to read and easier to write, which in turn encourages you to write more tests. I haven’t found property-based testing as useful as unit tests, but if you have a simple dumb solution and you want to check your optimised clever solution maintains the same behaviour, QuickCheck (or Lazy SmallCheck) is a handy way to test equality of functions.